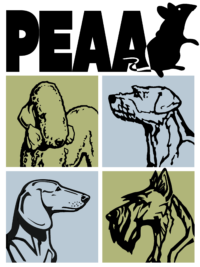 The purpose of the CKC Earthdog Tests is to promote, preserve and recognize the working characteristics of Dachshunds and those Terrier breeds that were bred to go to ground on quarry such as Fox, Badger, Otter and bolt, bay or draw the quarry. Earthdog is one of many sports sanctioned under the Canadian Kennel Club. Only Dachshunds and those Terriers in Group IV and on the Miscellaneous list seeking eligibility for Group IV that are small enough to navigate a 9 inch drain are eligible to compete in earthdog tests. If your dog has a registration number with the CKC, then you are ready to enter a test! If not, you can apply for a PEN (Performance Event Number) with the CKC so you can compete. More information on obtaining a PEN number can be found here. For complete rules, you can download a copy directly from the CKC website here. For information on local trials and practices in the Calgary area, you can check out the Calendar on our website or join our Earthdog Facebook page here. Our practice and test area is a few minutes SW of Okotoks, Alberta in the beautiful foothills of the Rocky Mountains. Turn east on 455 Avenue and go to the end. The driveway is the second last one on the left before the dead end and the blue address sign reads 48120.